This amazing watercolor sky is perfect with so many different stamped images – trees, flowers, scenery, hot air balloons, birds, etc. It was super easy to create and oh how I love that deep blue color!! 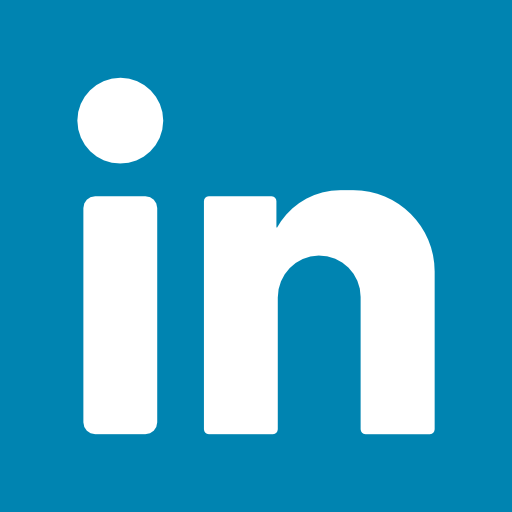 Now let’s get started on how I created this! I started with a piece of Pacific Point measuring 4-1/4″ x 11″ for my card base. Typically I just see what I have in my scraps section and pull out a piece so that is why sometimes it is 4-1/4″ x 11″ and sometimes 8-1/2″ x 5-1/2″! This one works perfectly for the ribbon to go around the card up and down! Then I took a piece of Watercolor Paper measuring 3″ x 3-3/4″ and colored rather dark/hard all down the middle with the Pacific Point Watercolor Pencil. Let me preface by saying that I’ve always colored really hard so this was easy for me. You can always go lighter and add in more color if you wish! Once you are finished adding color to the paper, I took an Aqua Painter and brushed back and forth. You want to make sure it is nice and wet (not dripping/soaked but wet and moving the color around.) You can take the color all the way to the edge or just keep it down the middle. Of course, the cool…or maybe frustrating…..thing about watercolor is that no two come out the same. You just never know what you will get. Now set it aside to dry! 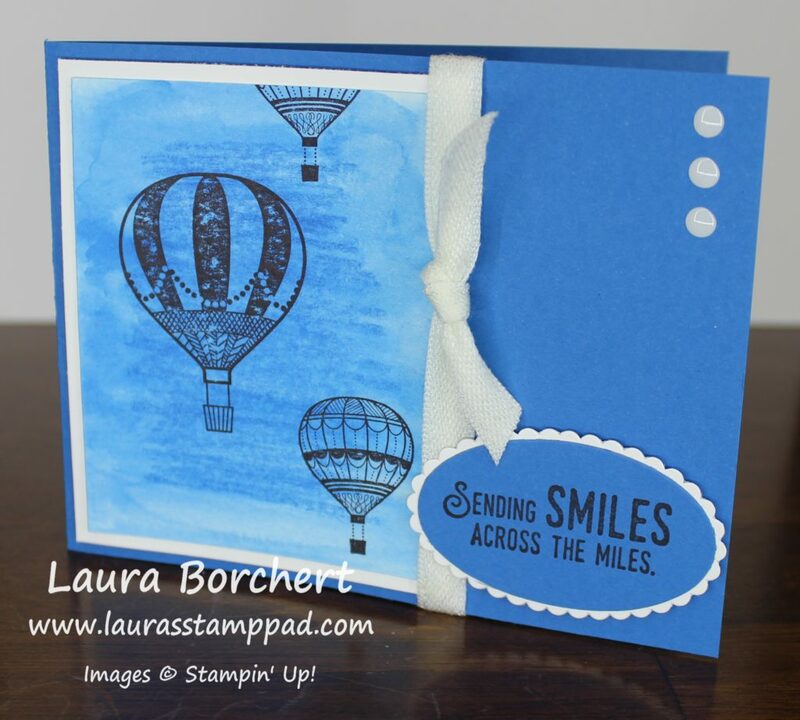 Once it was all dry, I stamped the hot air balloons from the Lift Me Up Stamp Set in Basic Black. PS: if you have no patience for it to dry like me, you can use your Heat Tool to speed it up! 🙂 Next, I layered this onto Whisper White (4″ x 3-1/4″) to really make it POP. I placed it onto the card front on the left side! Then I wrapped some of the Succulent Garden Ribbon around and tied it into a knot! 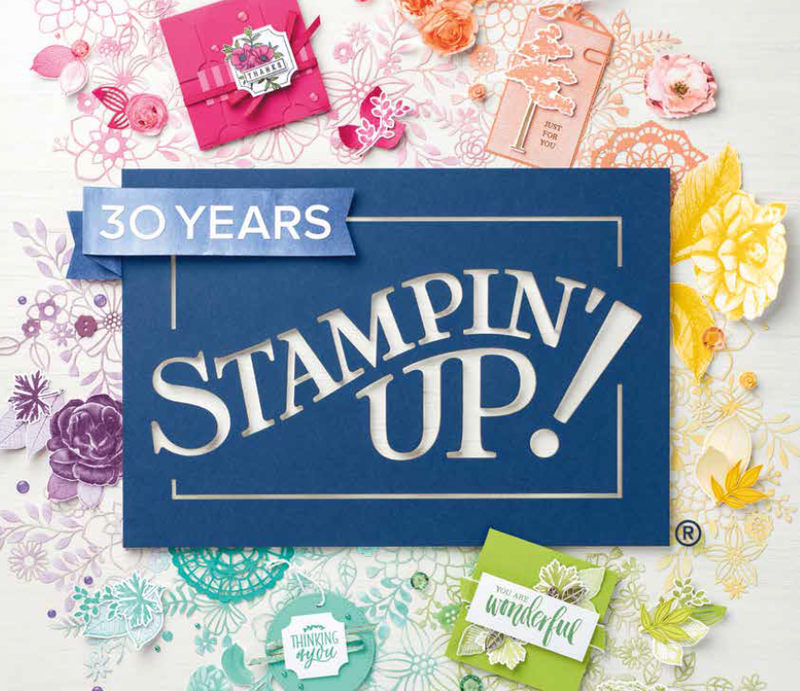 For the greeting, I stamped using the Lift Me Up Stamp Set onto Pacific Point. Using the Layering Oval Framelits, I die cut the greeting and scallop oval. Next, I added the greeting to the card front with Stampin’ Dimensionals so it would look smooth over the ribbon! I thought it looked a little empty in the upper right corner so I added a few White Perfect Accents! That was the perfect fix! Do you love to watercolor? Let me know your favorite watercolor tools in the comments below – Blender Pens, Aqua Painters, etc? To see more samples using watercoloring, check them out here, here, and here! On the 9th Day of Stamps-Mas!!! 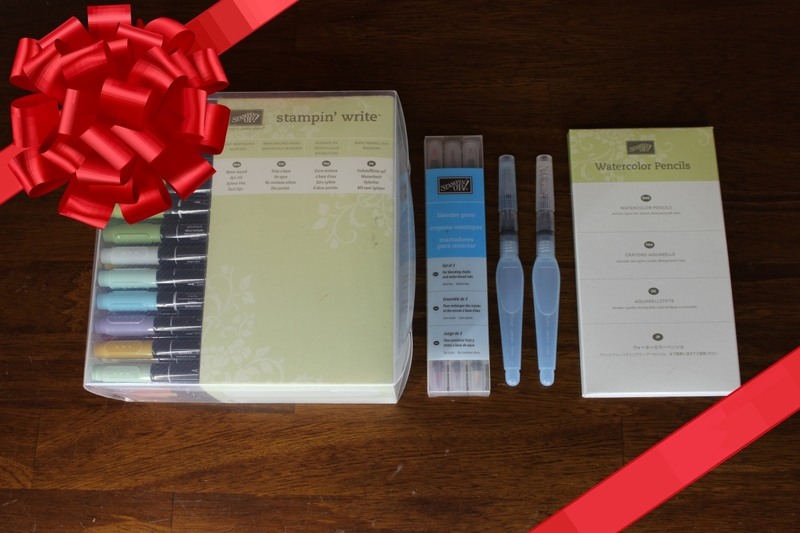 On the 9th Day of Stamps-Mas, my true love gave to me…..coloring tools!!! Markers, Aqua Painters, and Blender Pens make coloring stamped images or background so much fun!!! Also, you will notice……Watercolor Pencils in this photo. That is because they are coming out in the Occasions Mini Catalog on January 4th!!! WOOT WOOT! Aqua Painters are probably my favorite out of all of these above. I feel like I have found my groove on using them and just love the look that comes out. I like to use a Clear Block pressed into an ink pad as my color palette. Then just brush into the color and then color on your project. You never really want to squeeze when coloring because then you will too much water. You also don’t want to press hard on tip because it will flare the bristles and allow more water to come out. You can use these for a watercolor background like in this sample or to color small details like this sample. You can also add other things into the pen like alcohol or bleach for many other techniques!!! Also, you don’t always have to use these with Watercolor Paper. You can use any type of paper like Whisper White, Very Vanilla, or Shimmery White. Check out this video tutorial to see more on these! Blender Pens are similar to Aqua Painters but they are more like a clear marker. There isn’t a way to squeeze out too much water so you never have to worry about that. Again, you can pick up color from a marker, pencil, or color palette like the one mentioned above! I feel like these are to much like a marker and I end up with streaks but for small things I think they work well. When doing a large image, I prefer Aqua Painters. Markers are always great to have on hand. Any time I leave my house to craft, I always take them because then if I forget an ink pad I still have every color. 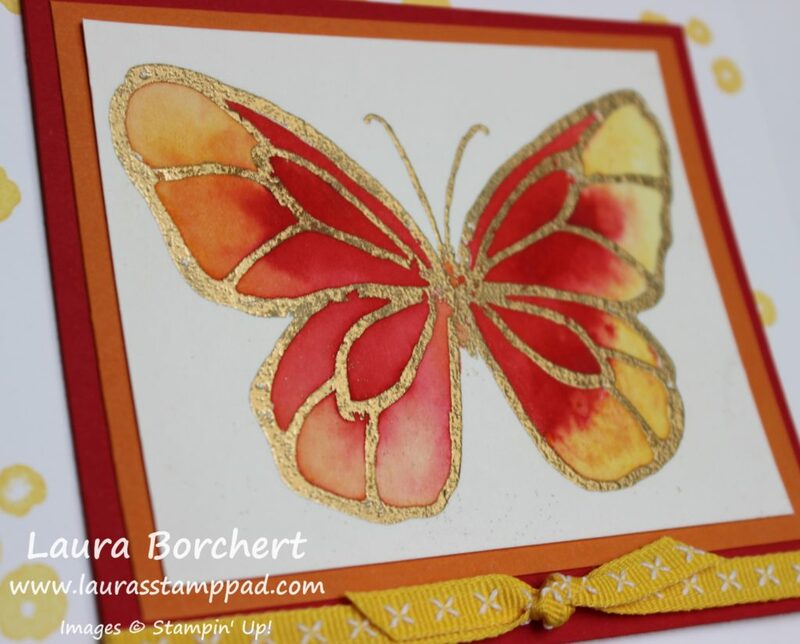 I love that you can color with the markers directly onto the stamps to create multi-colored stamped images, omitted images, and so much more! I don’t really prefer to color in an image with the markers, at least not a large image. I tend to always see the strokes of the marker when I use them for coloring. Each marker has 2 ends – a larger marker tip and a smaller pen tip. This makes journaling fun when you are scrapbooking! Because there are 2 ends to the markers, you want to make sure that you store the markers on their side so the ink doesn’t go all the way to one side. What is your favorite coloring tool?? Let me know in the comments below!! 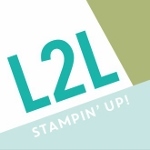 If you have missed out on the past days of Stamps-Mas, you can check them out here – Day 1, Day 2, Day 3, Day 4, Day 5, Day 6, Day 7, and Day 8. 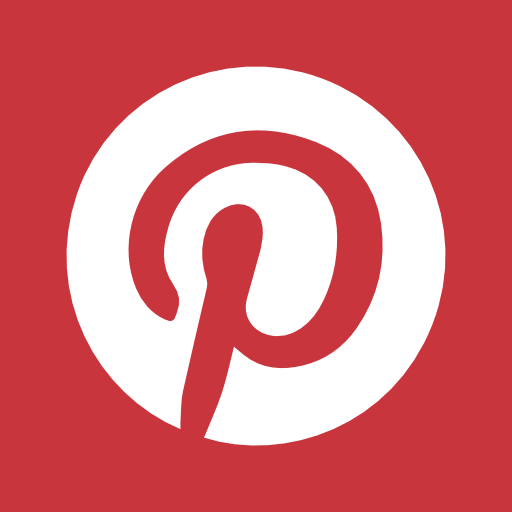 Be sure to subscribe to my blog so you don’t miss the next 3! You can do that by adding your email address in the subscribe box on the right hand side (on a computer) or at the bottom of the page (on a phone). I really struggle with Man Cards so when I saw the In The Meadow Stamp Set, I though I need that set!!! It is the perfect masculine look. I have lots of family and friends who are outdoorsy so this is perfect!!! I started with a piece of Very Vanilla cardstock measuring 3-1/2″ x 4-1/2″ and I stamped the deer and trees with Basic Gray Archival Ink. I like the lighter look of gray over black for this card! You can always add in a little bit of the grass to fill in if you would like to. 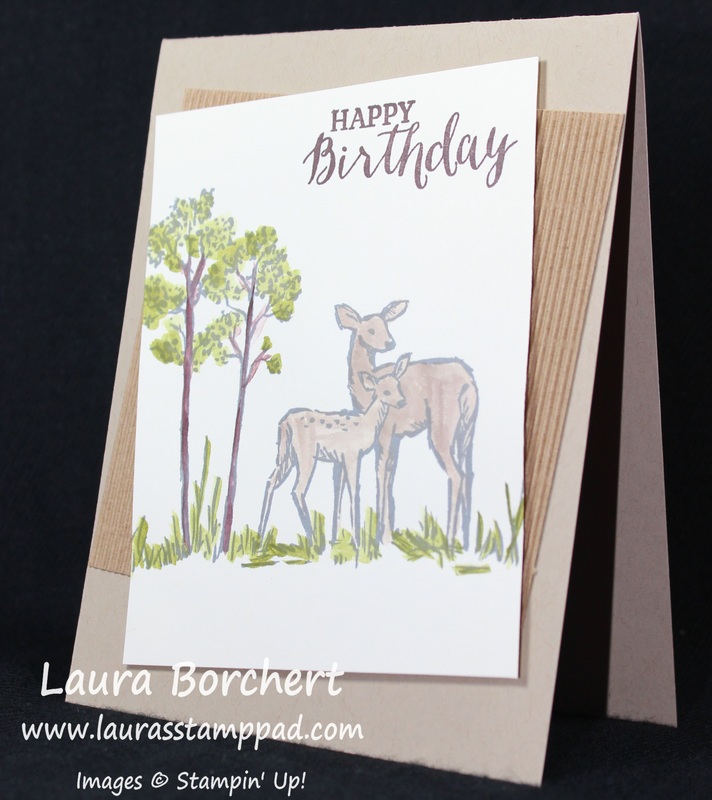 All of the images are from the In The Meadow Stamp Set from the Occasions Mini Catalog. The greeting was stamped in Chocolate Chip from the Rose Wonder Stamp Set! I colored in the images with an Aqua Painter! I did the deer in Crumb Cake, the grass and leaves in Old Olive, and the tree trunk in Chocolate Chip. You can always make one of the deer a different color to off set them a little more. I’m really starting to like coloring with an Aqua Painter! I took a Crumb Cake card base and added a piece of the Corrugated Cardstock (4″ x 4″) with opposing corner touching the sides. I thought I would do an off set look rather than just layering it on there. 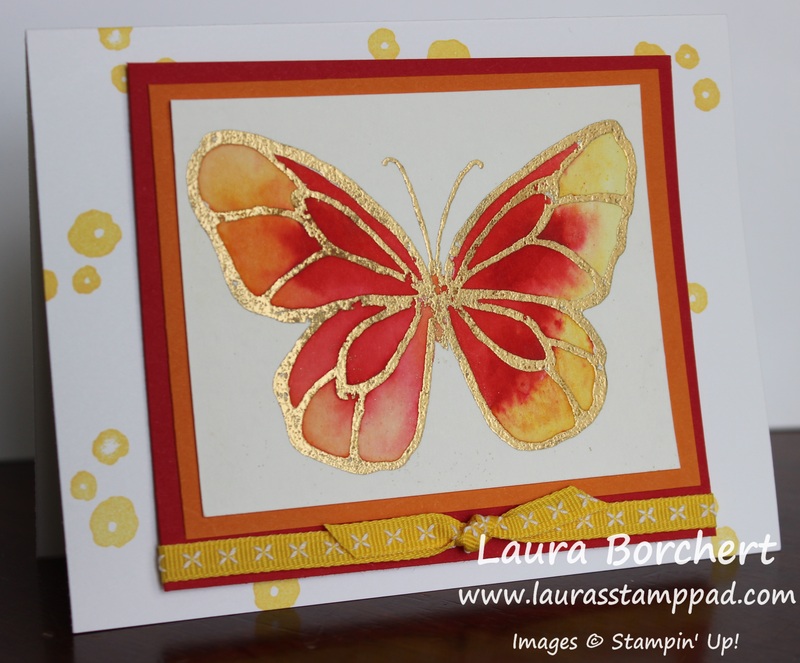 I added the Very Vanilla to the card front with Stampin’ Dimensionals. 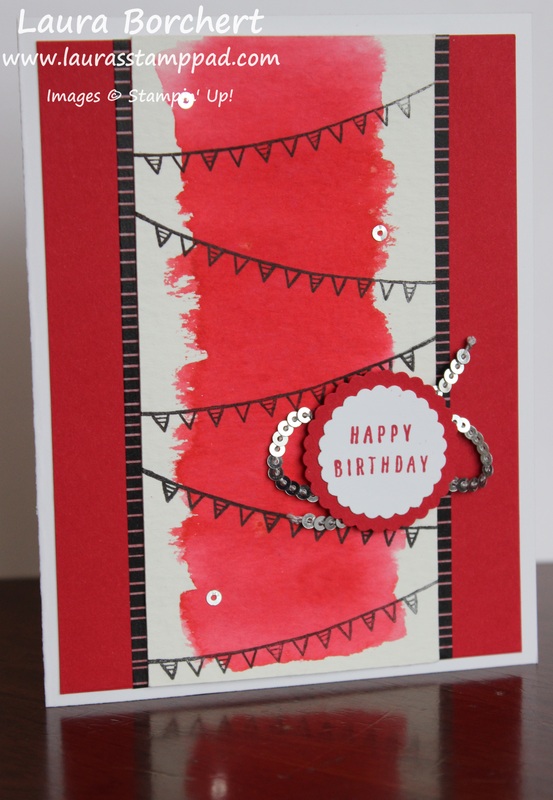 This adds texture and dimension to the card but also makes for a smooth look on the corrugated paper. Love it! I plan on making lots of these for Father’s Day, Birthdays, and maybe even Sympathy. If you would like to see this in action, check out my Video Tutorial below or by clicking here! Don’t forget to give this video a thumbs up if you liked and be sure to subscribe if your new! 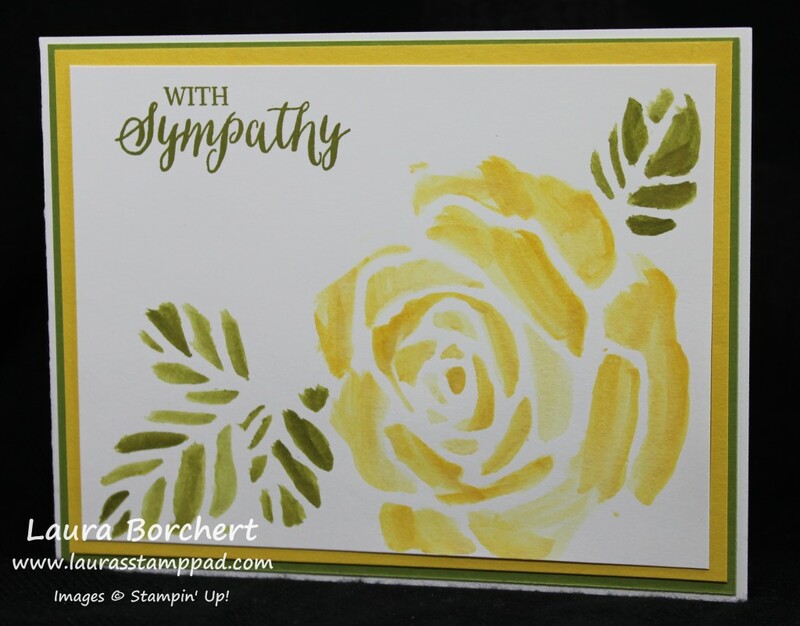 Technique Tuesday – Painting Roses!!! Happy Tuesday!!! That means I have a fabulous technique to share with you!! This one is super fun, simple, and mistakes are okay!!! How fabulous is that? Check out this beauty!!! How lovely is that rose??? Of course I used the Rose Wonder Bundle from the Occasions Mini Catalog!!! I am loving that set. You can see more samples here and here and here! Let’s get started on the beauty! 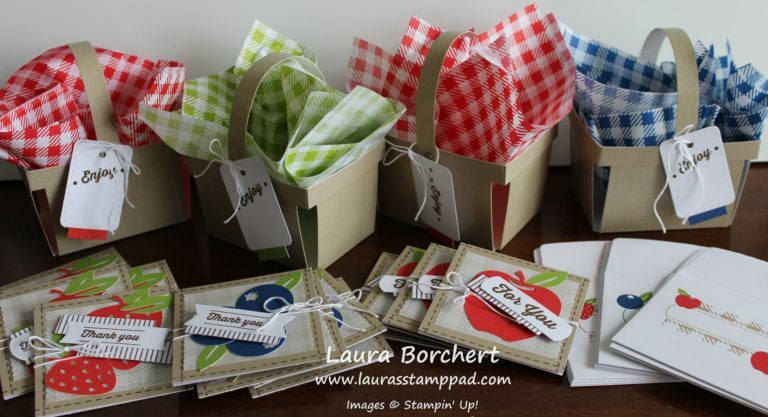 Don’t forget that you can Bundle & Save 15% when you purchase the stamp set and framelits together! Trust me you totally want them! I am loving them! So I die-cut the large rose framelit with some cardboard/thick cardstock. I used the piece that comes in the Designer Series Paper Pack on the back. It is that thicker cardboard type stuff that holds the paper stiff. I ran that through the Big Shot a couple times to ensure a nice cut on this thicker material. Then I popped out all of the pieces with the Big Shot Die Brush. 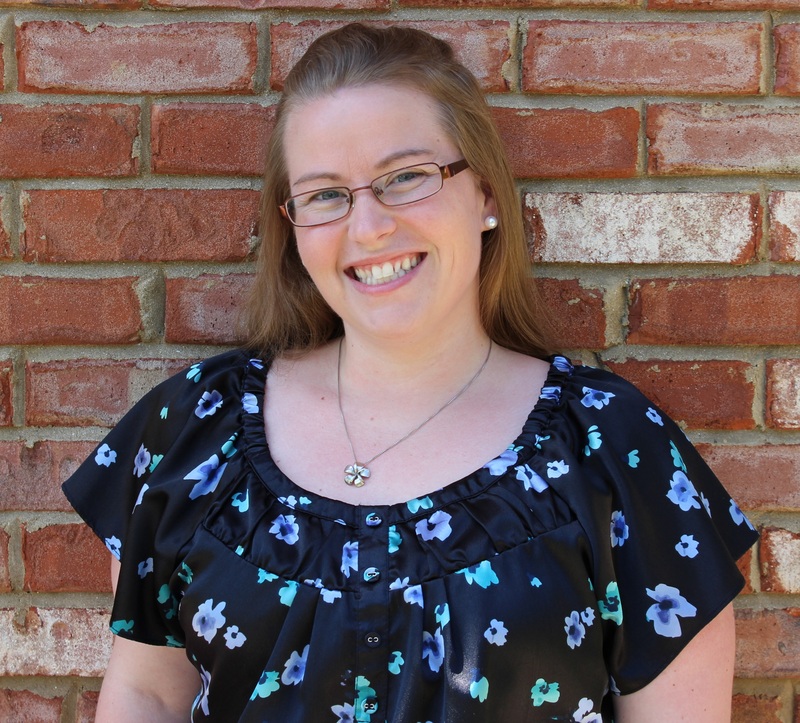 I then laid the die onto a piece of Whisper White measuring 3-3/4″ x 5″. You can lay it on there with parts falling off or with the entire piece. Either way it will look fabulous. You will need to pick a color for your rose and for the leaves. I used Daffodil Delight and Old Olive. Then using a Aqua Painter, pick up some color and then paint in the holes of the framelit. It doesn’t need to be delicate and perfect. It just a little swish swish over the top of the template and into the holes. Some might be dark and some might be light. Sometimes your Aqua Painter will slide under the template and sometimes the template might move on you a bit. It’s all good. It will still come out fabulous!!! Once you have done both colors, you can stamp your greeting in the corner. 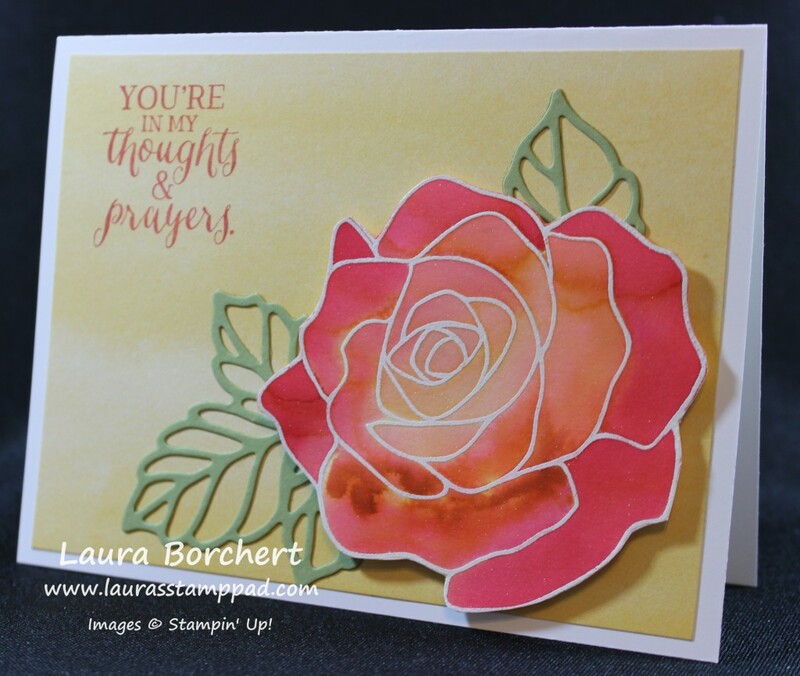 I used a greeting from the Rose Wonder Stamp Set. I stamped it in Old Olive. You might want to set it aside to dry a little before assembling. I layered mine onto a piece of Daffodil Delight measuring 4″ x 5-1/4″ and then Old Olive measuring 4-1/8″ x 5-3/8″. I placed it onto a card base of Whisper White. I really like how colorful and POPy all of those layers make it. I love it and think it would be fabulous in purple or orange or pink. Oh I’m getting excited for doing more. You could even cut Black and White layers and then make them any color. Oh the options! 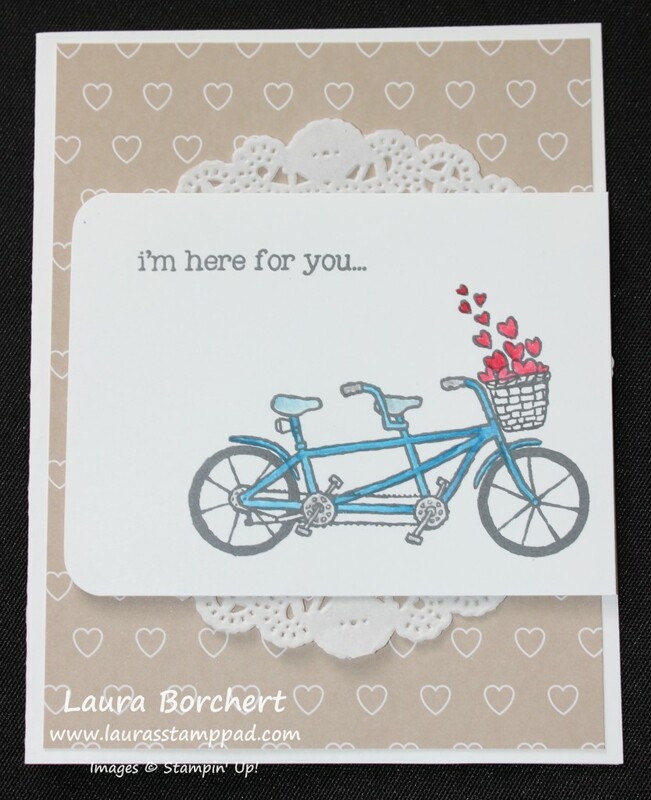 This card would be perfect for lots of occasions as well! If you would like to see this in action, check out my Video Tutorial below or click here! 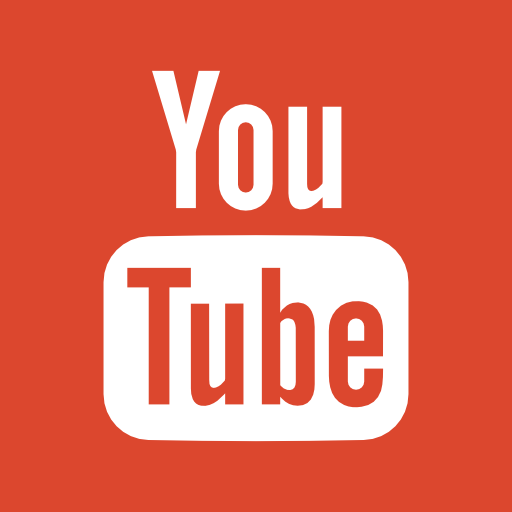 Don’t forget to give it a thumbs up if you liked it and be sure to subscribe so you don’t miss future videos. I posted them every Tuesday and Thursday!!! I can’t believe Sale-A-Bration is almost over!!!! Be sure to stock up on supplies and goodies now so you can earn FREE Sale-A-Bration items. This promotion ends on March 31st! Today I’m showcasing the Pedal Pusher Sale-A-Bration Stamp Set! It has this cute bike in it and it is super fun!!!! I started with a Whisper White card base and added a piece of Love Blossoms Designer Series Paper measuring 4″ x 5-1/4″! Then I placed a White Tea Lace Doily on the front of the card with the edge of it on the right hand side of the card! If you would like more or less doily, you can always cut it and add as much as you wish! For the focal point, I cut out a piece of Whisper White measuring 4″ x 3″. 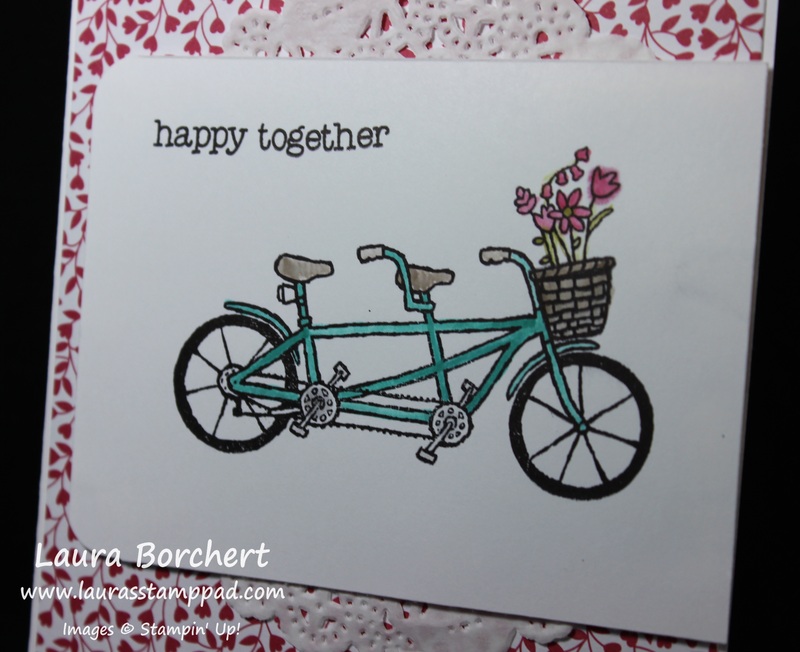 I stamped the bicycle and greeting in Basic Black Archival Ink from the Pedal Pusher Stamp Set! 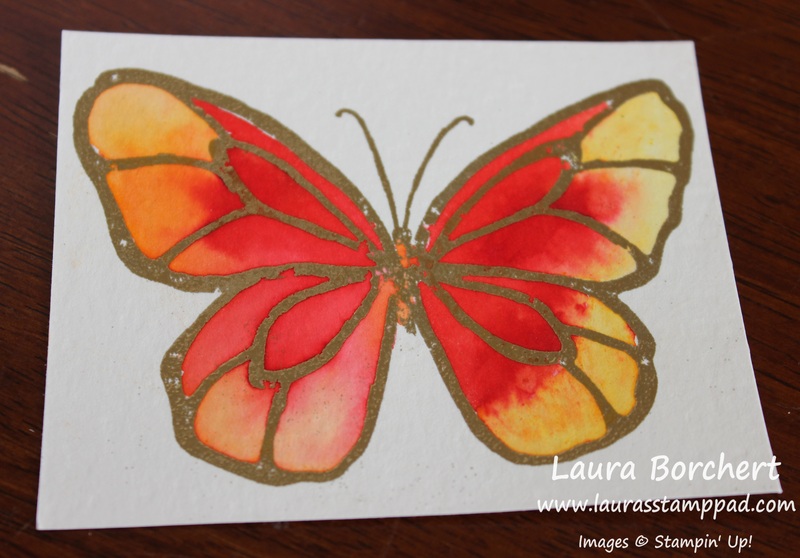 I colored it in with a Blender Pen using Bermuda Bay, Tip Top Taupe, Pear Pizzazz and Rose Red Ink. Once I was done coloring, I used the Corner Punch to round the 2 left side corners. I added this piece to my card front with Stampin’ Dimensionals for a little texture! I think it is super cute and would make a great Anniversary card! Here is another sample I created using Pacific Point, Real Red and Basic Gray! If you would like to see this technique in action, check out the video tutorial below or click here! Don’t forget to give it a thumbs up if you liked it and be sure to subscribe! Technique Tuesday – Floating Watercolor!!! Happy Tuesday!!! 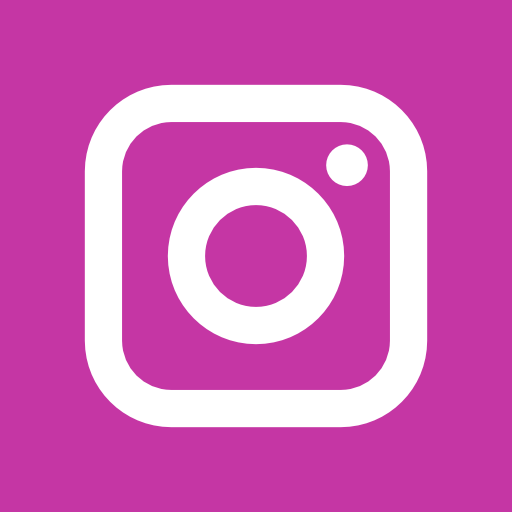 I have a super fun technique to share with you today!!! It includes watercoloring so remember that each one will turn out differently and it requires some patience….but the look is AMAZING!!! Check this out!!! I honestly think this blue one is my favorite even though I don’t know if I have ever seen a blue rose like this. I just love it!!! Okay so let’s get started. 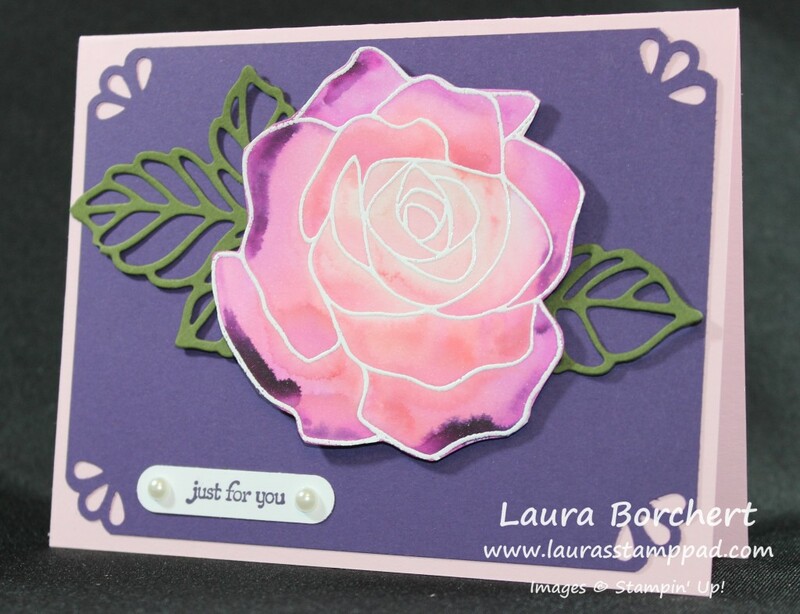 You will need a piece of Shimmery White cardstock for the rose. This cardstock is thicker than regular Whisper White but not as thick as Watercolor Paper so it works perfectly. It always has that beautiful shimmer which is fun! 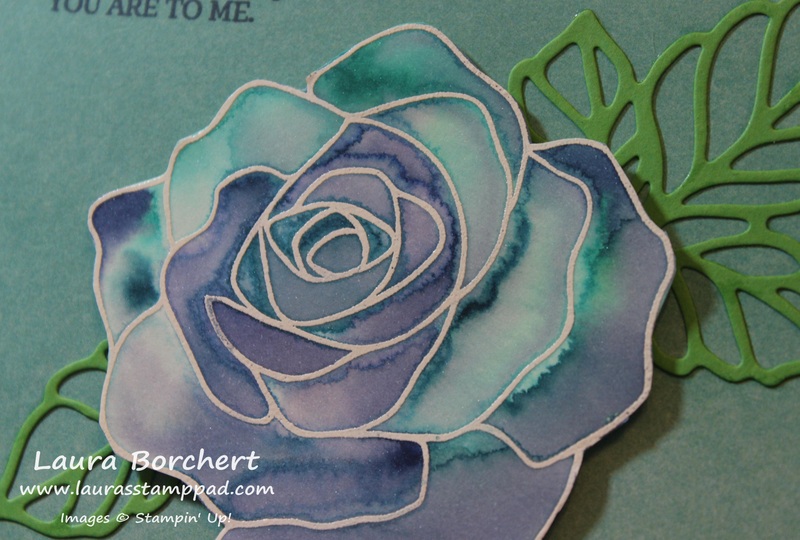 I stamped the rose from the Rose Wonder Stamp Set in VersaMark onto the cardstock. No need to worry about the leaves since you will cut them off. Then you will pour White Embossing Powder over the it and using the Heat Tool, set the powder. Now you will need to pick your colors and add a little drop of re-inker to a clear block or press the block into the ink pad to get some color. Then you are all set with your image, you will spritz the heck out of it with water. I mean like puddles on top of your image. Using an Aqua Painter, lightly touch the ink and then touch the tip of the Aqua Painter into one of the puddles on the flower. You can start with a light color on the outside or inside whichever you prefer. For the rose above, I used Bermuda Bay, Island Indigo, and Night of Navy. When you touch the color to the water, you will see it spread out all over. If it doesn’t but instead seem really dark and like it soaked into the paper, you need more water. You can either squeeze the Aqua Painter or spritz again. Add color as much as you would like. A good tip for myself is….If you think it needs a bit more, STOP! I tend to do a little more here and then there and it ends up messing up. Also, it will dry differently then it looks right now too! You can either set it aside to dry OR you can tip it a bit and allow it to dry like that. This allows the excess water to run to one side and dry darker in those spots. I prop it up on a clear block. 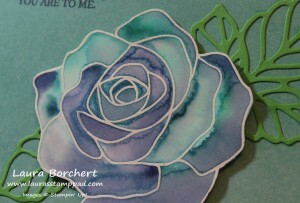 Once it is all dry, you can cut it out along the border of the embossing flower and add it to your card front. I used the Rose Garden Framelits (Bundle & Save 15%) to die cut the leaves in Cucumber Crush. I used a Whisper White card base and some of the Artistically Yours Designer Series Paper from Sale-A-Bration! 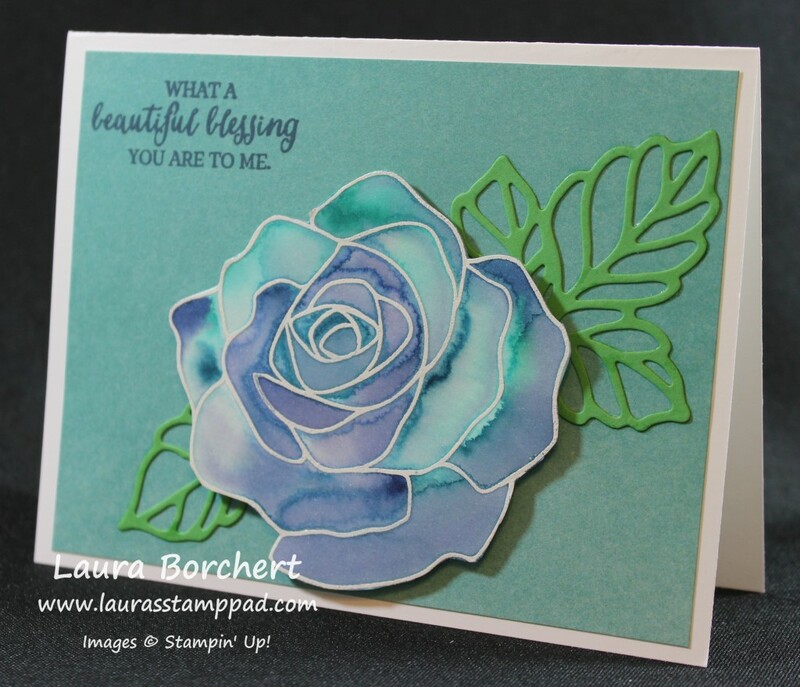 I stamped the greeting from the Rose Wonder Stamp Set! For this rose, I used Real Red, Tangerine Tango and Daffodil Delight. I love how it turned out. The leaves on this one were die cut in Pear Pizzazz! For this one, I used Blushing Bride, Watermelon Wonder, and Elegant Eggplant. You can see those really dark purple spots….that was where I didn’t have enough water and the paper just soaked up the color strongly. I used Mossy Meadow for the leaves on this one. I also used the Curvy Corner Trio Punch as well. If you would like to see this technique in action, check out the video tutorial below or click here. Don’t forget to give it a thumbs up if you liked it and subscribe so you don’t miss any future videos! Which color combination is your favorite? Let me know in the comments below! The blue one is my favorite! Technique Tuesday – Watercolor Wildflowers!!! Happy Tuesday! I am so stinking giddy about sharing this card with you today! I LOVE IT! It’s so soft and beautiful. I know I know, it’s not my usual bright colors but it is flowers! 😉 The technique I’m sharing with you is a little watercoloring with the Aqua Painter. I know many might not like it or have never tried it so I’m going to share some tips and tricks today!!! 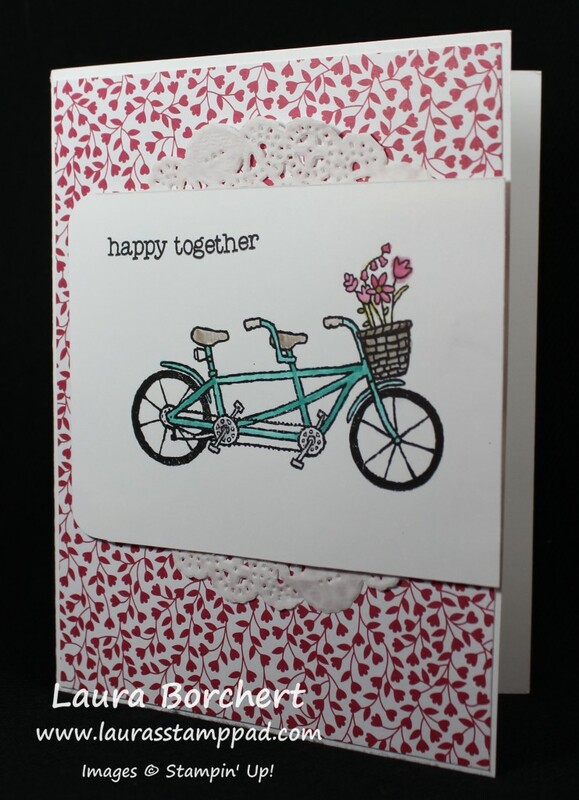 This card also screams Spring with the pastels and blooming flowers. Oh how I am counting down the days still Spring – 47 more days!!! Let’s get started on this beauty!!!! I took a piece of Whisper White cardstock measuring 4″ x 5-1/4″ and stamped each of the flowers from the Flowering Fields Sale-A-Bration Stamp Set. I used every image in the set except the butterfly and I really should have added him in. That would have been amazing! 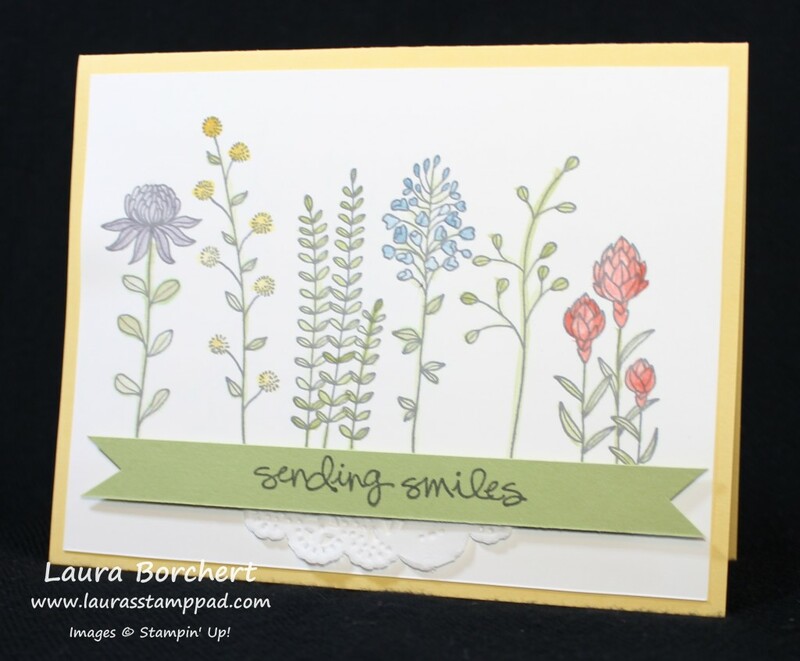 I stamped all of the flowers with Basic Gray Archival Ink which you can use for watercoloring. I liked the softer look of the gray verses a black. It is okay if the flowers don’t all line up along the bottom because the greeting banner is going to cover that up! Now that your images are stamped, it is time to color. I have found that when using an Aqua Painter, you don’t need to squeeze it at all. The water will gently come out as you color. I also found that just barely touching it to the paper is best for those fine lines. I tend to press hard but then the brush tip bends and it becomes really wide and all over the place. Just a light touch to the paper works best. If you don’t like making a mess on the inside of your ink pads to create a color palette, just press a clear block into the stamp pad and use that as your color palette and then rinse off when you are done. You can always add re-inker to the clear block as well. I used Pear Pizzazz for my stems. The flowers are (left to right) Wisteria Wonder, Hello Honey, Pear Pizzazz, Marina Mist, Pear Pizzazz, and Calypso Coral. Another tip that I have is allow it to dry a little and then go back and add accents or more color. Don’t think that you have to get the perfect look with one swipe. Have fun with it!!! 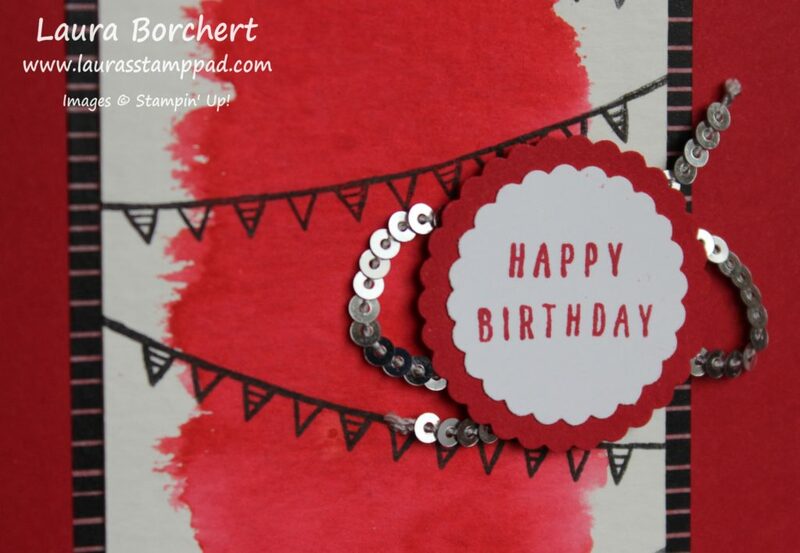 For the greeting I stamped it in Basic Gray onto Pear Pizzazz from the Greatest Greetings Stamp Set. This card could really have any type of greeting on it! 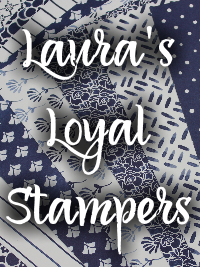 I added a little piece of Tea Lace Doily to the bottom of the banner and adhered it to the card with Stampin’ Dimensionals! By adding just a little piece of the doily, I can get 3, sometimes 4 of these out of one doily. I love getting the most out of my supplies! If you would like to see this in action and how I used the Aqua Painter, check out the Video Tutorial below or click here! Don’t forget to give it a thumbs up if you liked and subscribe so you are notified when I post the next one! Let me know in the comments below which you prefer – Aqua Painter, Blender Pens, Marker, or not a fan of coloring!! !